Crucial, a leading global brand of memory and storage upgrades, is now sampling DDR4 server memory through its new Technology Enablement Program. Aimed at channel partners who are currently developing or evaluating DDR4-capable platforms, the program provides early access to select Crucial server DDR4 modules and relevant technical resources, as well as notification of new modules as they become available. The Crucial Technology Enablement Program comes on the heels of Micron’s recent ramp up in DDR4 production. More information on the enrollment process can be found at www.crucial.com/usa/en/memory-ddr4-info. Designed to enable next generation enterprise environments, Crucial DDR4 server memory delivers data rates that start at 2133 MT/s (up to twice as fast as DDR3 when it was introduced) and is expected to get even faster as the technology matures. What's more, when used with Intel® Xeon™ processor E5-2600 v3 product family-based systems, Crucial DDR4 server memory doubles memory bandwidth from 8.5GB/s to 17GB/s. Additionally, Crucial DDR4 memory uses up to 20 percent less voltage than DDR3 technology, operating at 1.2V compared to 1.5V for standard DDR3 memory, and delivers up to a 40 percent reduction in power usage. "Memory is one of the biggest limitations when it comes to enterprise server environments. Many memory-dependent server applications are crucial to the day-to-day operations of a business, but they require higher densities of memory and increased performance," said Michael Moreland, worldwide product marketing manager, Crucial. "Crucial DDR4 memory enables servers to perform faster and run more efficiently than ever before, reducing power and cooling expenses along the way­ – essential for meeting the ever-increasing workload demands of data centers." 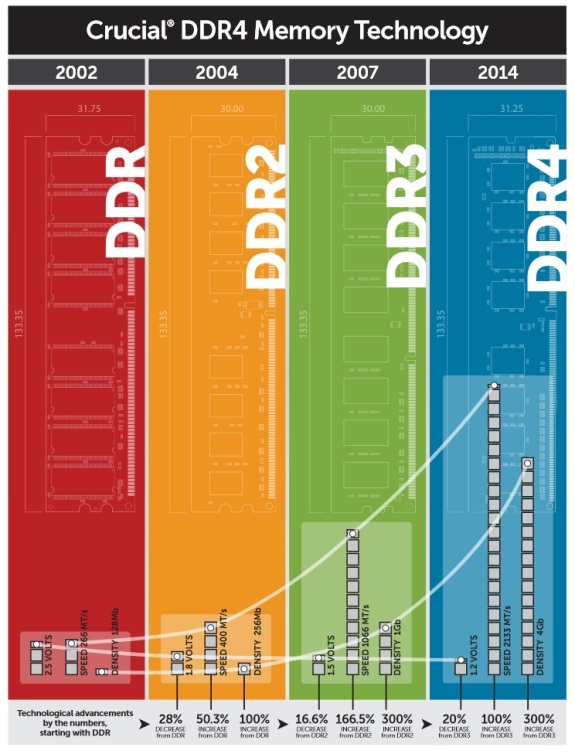 All Crucial DDR4 DRAM modules are backed by a limited lifetime warranty. ** For more information on Crucial DDR4 memory or the DDR4 Technology Enablement Program, please visit www.crucial.com/usa/en/memory-ddr4-info.